Connecting with Angels for IMMEDIATE help. Connecting with Angels is a powerful and amazing way to accelerate the inner growth of your soul. All you need to do to invoke the angels to your side is to ask for their guidance and assistance, then stop and listen. Because of the "Law of Free Will" they can do nothing unless you ask. Immediate help is available to you at any time and in any place. Invite and welcome them into your life, it is a most powerful spiritual practice and this simple practice will create great value in your life. Every person and that includes you my friend, has one or more Guardian Angels to help and assist you throughout life. Needless to say, every human activity like partnerships, businesses, organizations and relationships - also have one or more angels that preside over offerings of grace, assistance and blessings. Choose a regular time each day to communicate with your guardian angels i.e. before going to sleep or when you first wake up, choose the best time for you. If you have depression, negative feelings, fear, nightmares - ask your guardian angels for extra protection. Remain open to messages from your angel at all times, especially when you sense a warning that you are making a mistake or you feel that prickly feeling of danger. Don't be irresponsible and risk your personal safety. Your guardian angel can't override your free will. Be positive! Your angel will guide, heal and protect you but you must be responsible for your own actions. Don't blame others or dismiss problems in your life as either "something or someone being against you" or it being a curse. Have an image of the angel you wish to connect with, I normally use one of the cards from the pack of "Angel Altar Cards" as I find it helps me focus my intention. Knowing about the Archangel individually how to invoke, make contact and heal with their help has been something that I have enjoyed using, I can not tell you how many times they have helped me and or in how many different ways. They are just so amazing! . Connecting with angels by writing to them in a letter - The idea is to pour out you heart and soul to them. Do not censor anything. Simply let out all of your concerns and feelings and problems on paper and then ask the angels to help you in solving everything, for the highest and best for all concerned. And then let go trust in the miracles that will happen through the angels. As part of the releasing process you can finish this session by burning the letter as it serves to cleanse your mind when you do. Connecting with angels using Angel Affirmations -Affirmations are part of daily vocabulary, whether we are aware of it or not. Unfortunately we tend to not be aware of the negative affirmations running through our mind at any given time and this sets us up for disappointment somewhere down the line. Our mind believes what we tell it. We can call on the angels to help us transform our negative affirmations into positive ones. Get YOUR Angel Altar Cards now! They can help us to become more aware of what to say to ourselves and they can help us to reframe these messages into more positive life affirming statements. Connecting with angels by creating an Angel Altar - You don't need much space for this; just select an area that is meaningful to you, perhaps where you like to relax, read, meditate or write. You can place anything on your altar that signifies angels to you. It is important that this altar hold special meaning for you and so the objects you choose should reflect your tastes and preferences. Some items could include: angel objects, feathers, candles, incense and angel cards. 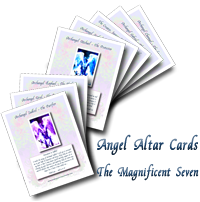 I have created a set of beautiful Angel Altar Cards just for you to use when creating your own Angel Altar. With the powerful angel energy emitted from these cards your altar will become a angel portal for the constant flow of love, peace, serenity, healing, illumination, balance and harmony. Ask for the Angels' help and guidance - when connecting with angels and you call upon Angels in meditation, prayer, sacred ceremony, or with a simple thought in daily life, you are really preparing yourself to receive communion with them, your awareness heightens, your consciousness rises, your subtle senses begin to open and expand, your energy increases and the frequency that you vibrate at also increases. Be receptive - as you ask the Angels to work with you to help you bring forth your greatest gifts, obstacles that you have long been struggling with will fall away and you find resources that moments before you did not realize were there for you, paths open to you that you could not see before, synchronicities increase and the loving hand of serendipity will touch you more frequently. Surrender - when connecting with angels, be careful to release your expectations of how they will help you, how it will look, what you will receive as your soul and the Angels know much better than your mind (and your mind's desires) what will most serve you. Have you ever been driving somewhere, had a thought that you didn't want to be late, and all of a sudden had an urge to make a turn you didn't plan on. Then later you found out there was a bad traffic jam that you avoided by listening to that urge and turning off the road? That is one way that angels assist you. Gratitude and Appreciation - be grateful for and appreciate all you have right now as these are the stepping stones along the path of allowing Angels to be more present in your life. Have Faith and Be Thankful - know that it is done, nothing that will serve you is ever withheld from you as Angels are always with us and are eager to help us, they are loving and supportive partners in all of your endeavors and they help you to reach beyond your fears to your highest and best expressions of yourself, thank them when you notice the correlation. Love and Celebrate the person you are - trust the wisdom of your soul and allow yourself to move more deeply into a relationship with the Angels - allow heaven to help you - you are infinitely loved. What if I don't feel a connection? Angels vibrate at a very high level and it may take a while to attune yourself to this high vibration. Be patient! Your diet - meat, caffeine, shellfish, most junk food (including chocolate), pre-packaged foods that contain chemical additives and preservatives are all low vibration foods that can block divine guidance. Drugs can definitely influence connecting with angels - (even over the counter products) and alcohol can cloud clarity. Negative People - make changes where you can in your own life and try to avoid negative people. If you can't do this because of your circumstances, it may take you longer to connect, but keep trying; eventually you'll be able to tune in to the higher vibrations. Drama influences connecting with angels - whether the chaos is yours or originates from others in your life, it can make you distracted and agitated, which adds to the difficulty of connecting with angels. Ask your angels to clear away all negativity and fear and fill you with the energies of peace and love. Disorganization - angels are attracted to clean, organized, quiet atmospheres therefore provide a welcoming atmosphere to appeal to angels. Inexperience - if you haven't done a lot of spiritual work or find it hard to relax and quiet your mind, be patient and realistic with your expectations. Try to increase your awareness of angels by heightening all your senses and meditating regularly a few minutes at a time. Unrealistic Expectations can influence connecting with angels - if you're expecting a talking hologram to appear and talk to you for an extended amount of time, it's not going to happen. Especially at first, the contact may be brief and more of a feeling than visual or audio. If you are lonely, you need human contact! Get out and join clubs or groups with interests like yours. Life is meant to be lived - get out there! 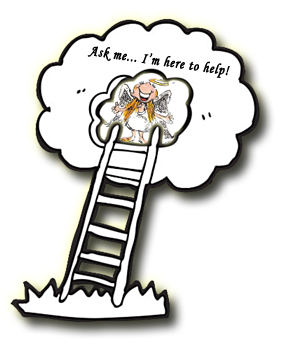 When connecting with angels you can also ask another persons' guardian angels for help or assistance. If someone, say your boss or a co-worker, is making life more difficult than you think is fair, ask their guardian angel to have them be nicer to you or leave you alone altogether. If you are having problems with a loved one, plead your case to their guardian angel and ask for their help to bring peace into the situation. Others' guardian angels are willing to help as long as our requests are positive and won't hurt the one they are to protect. If it's a big issue, write a letter to the person's guardian angels asking for help. It may sound bizarre but it works. The Archangels are especially useful with causes such as these! I wish you a beautiful and magical journey in your quest to connect with your angels! The Archangels are here to Transform your Life! Join the hundreds of others who have completed this Angel Healing home study course and gone on to feel close to the Archangels and their incredible power! 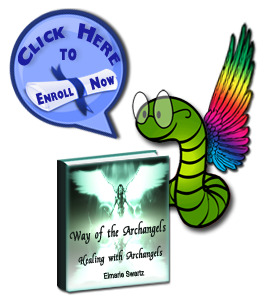 This course "Way of the Archangels" is for everyone no matter what your religious beliefs. Also you will get 6 must have works for your healing library.